Cmdr. 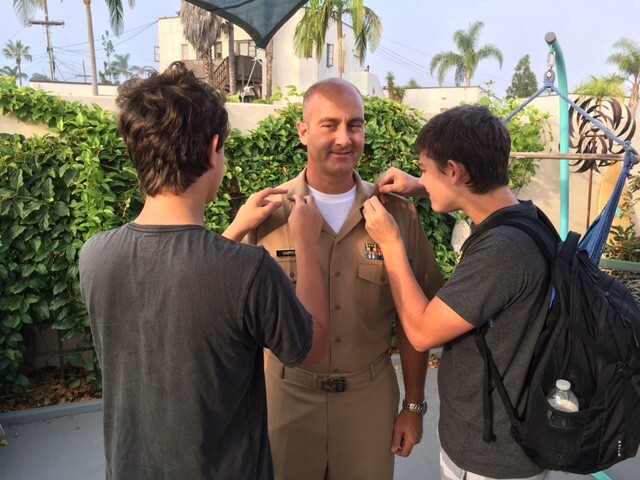 Neil Gabriel, of Mullica Hill, is pictured having his promotion pinned onto his U.S. Navy uniform by his sons Tyler (left) and Justin (right). Former Mullica Hill resident and Navy Lt. Cmdr. Neil R. Gabriel was promoted to commander on Sept. 1. Gabriel is a 1992 graduate of Clearview Regional High School and a 1996 graduate of The Richard Stockton College of New Jersey. He holds a master’s degree in biological sciences from the University of Delaware, and was commissioned as an ensign in the U.S. Navy through the Officer Candidate School in 2001. Gabriel is the son of Linda and Donald Trout of Mullica Hill, and the late Thomas R. Gabriel, Sr. He is married to the former Catherine Colanero of West Deptford. They reside with their sons Justin and Tyler at their new base in San Diego, Calif., where Gabriel is in training en route to U.S.S. Dewey, where he is the prospective executive officer.